What is the difference between a stromboli, a calzone, and a pizza? At least the way I understand it, the pizza is flat (duh), the calzone is a pizza that has been folded in half and pinched together at the seams, and a stromboli is a pizza that has been rolled up into a spiral loaf. Stromboli have always intrigued me, but the classic preparation involves a thick layer of greasy pepperoni. Maybe that sounds great to you, but even before I became a vegetarian, I avoided pepperoni like the plague. 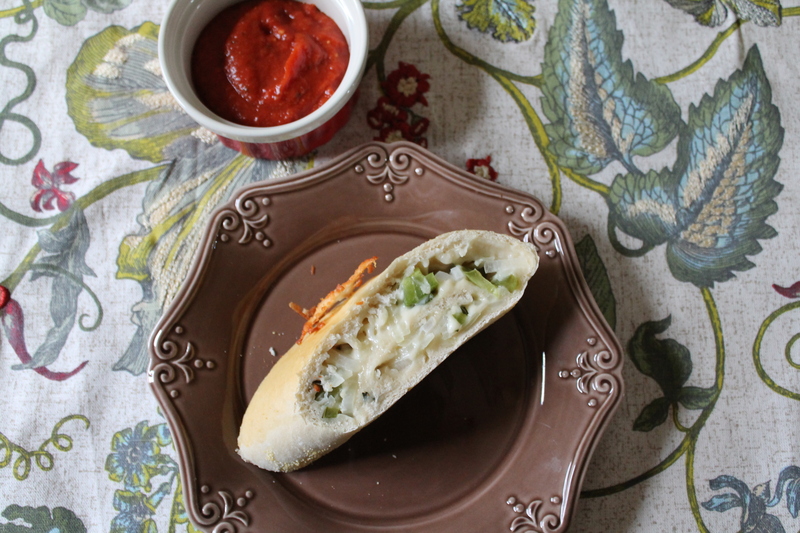 This version, with green pepper and onion and a ton of melty cheese, is just right for me! Quick! Run to your farmer’s market and buy some fresh veggies! Let’s make lunch! I highly recommend making your own pizza crust for this! The crust sets the whole tone for the stromboli. My favorite recipe comes from Cook’s Illustrated! Activate the yeast by sprinkling it over a bowl of warm water. It should get nice and foamy in about 5–10 minutes. Then you can add in the tepid water and the oil. In your mixer bowl, quickly stir together the flour and salt. 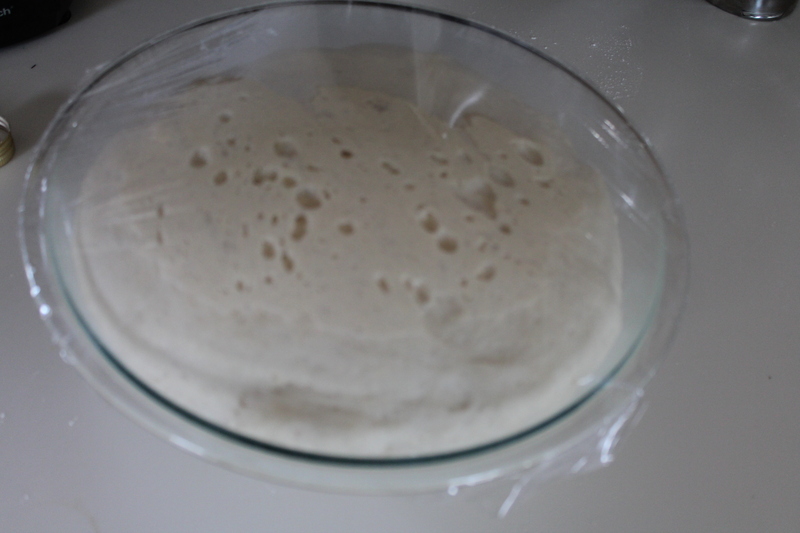 Pour the yeast mixture into the bowl and stir until the dough comes together. Continue kneading using the dough hook, about 5 minutes. Turn the dough into a lightly oiled bowl. Cover tightly with plastic wrap and then let it rise about 90 minutes, until doubled in size. Divide the dough in two and shape into tight balls. Let it relax for another 30 minutes. 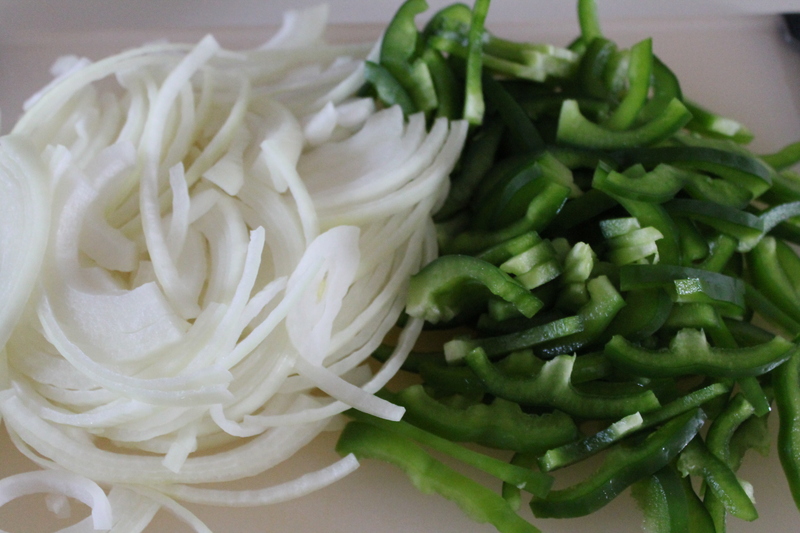 Meanwhile, thinly slice the onion into half-moons and julienne the green pepper. At this point, I generally wrap one of the dough balls up and freeze it for later! 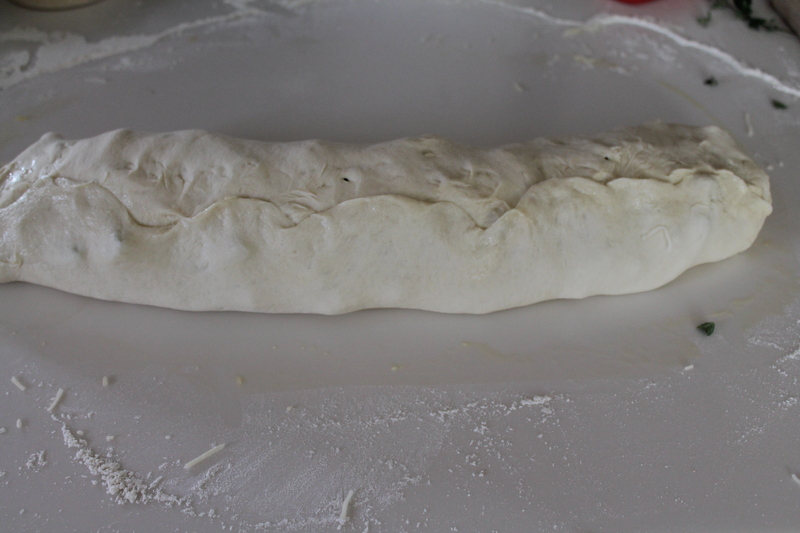 But you could also make a double batch of stromboli (in which case, don’t forget to chop an extra onion and pepper)! 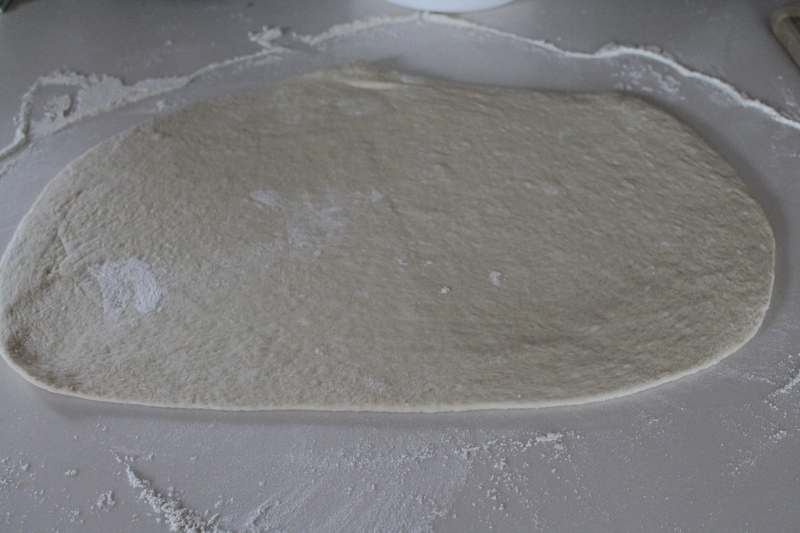 Roll out one ball of dough into a large rectangle, about 10″x15″. Layer with onions and peppers, mozarella, parmesan, and torn herbs. Leave a 1″ border around the edges so you can make a seam. Carefully roll the crust up into a long log. Brush one of the long edges with the egg wash and then press the edges together to seal. Let it rise another 20 minutes. Brush the top of the log lightly with the egg wash. Bake 20 minutes at 375°. 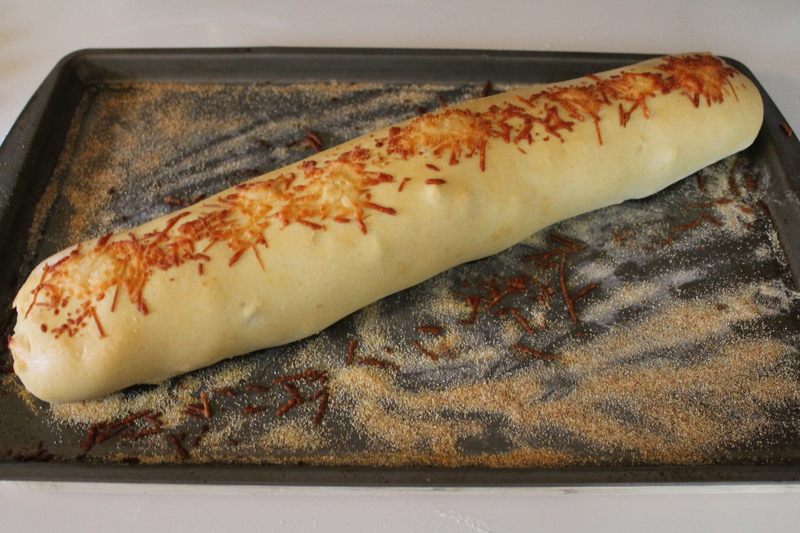 Pull the stromboli out of the oven and sprinkle with parmesan. Bake another 2 minutes, until the cheese is golden and puffed. Serve with spicy marinara for dipping. I decided to doctor up a store-bought marinara by adding crushed red pepper, garlic powder, and lots of basil. Mmmm. 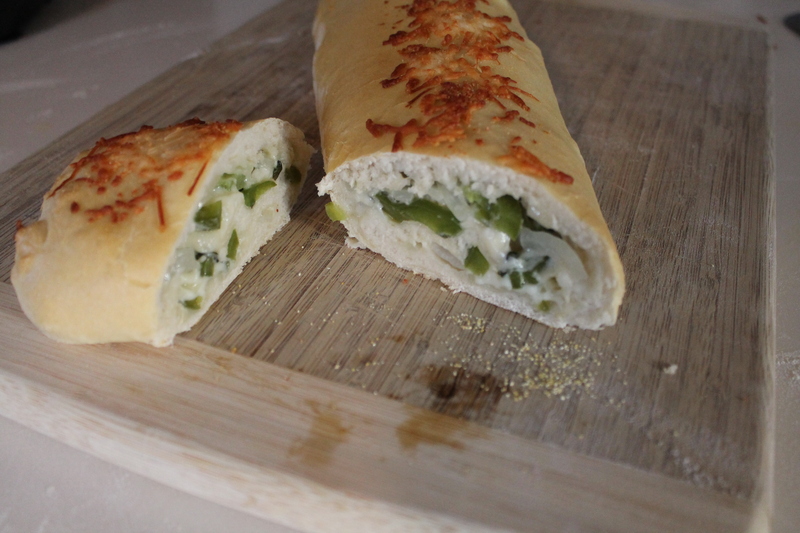 I wrote the recipe below to make 2 strombolis, but feel free to freeze half the dough and halve the filling ingredients if you would like to make one at a time. Make the crust dough. 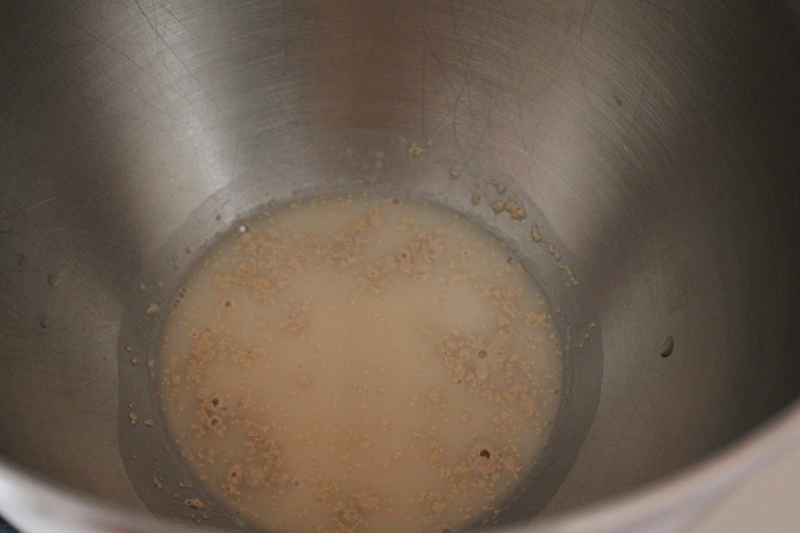 Sprinkle the yeast over the warm water and let it sit until foamy, about 10 minutes. Stir in the tepid water and olive oil. 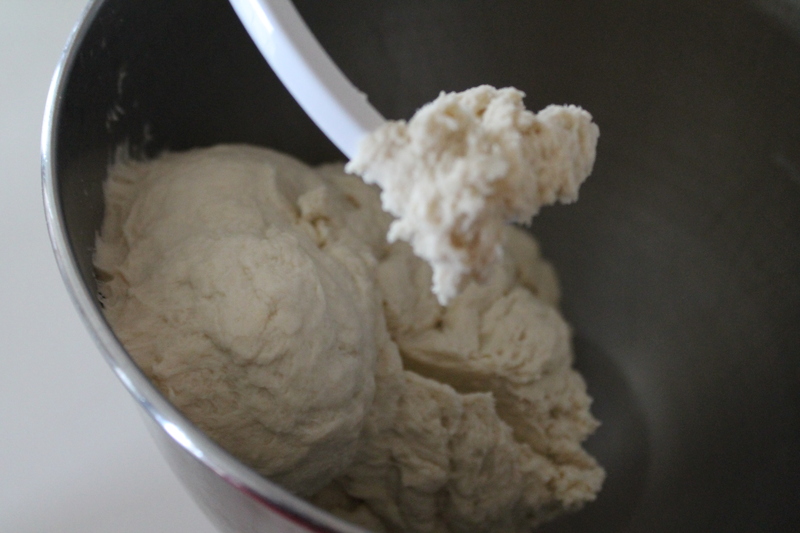 Whisk the bread flour and salt together in a mixer bowl. Add the wet ingredients to the bowl and stir, using the dough hook, until the mixture comes together, scraping the sides of the bowl as needed. Set the mixer to medium-high speed and knead for 5 minutes. Turn the dough out into a lightly oiled bowl. Cover with plastic wrap and let rise until doubled in size, about 1½–2 hours. Divide the dough in half and shape into two small balls. Set onto a lightly floured surface, cover, and let relax another 15–30 minutes so they will be elastic enough to roll out. 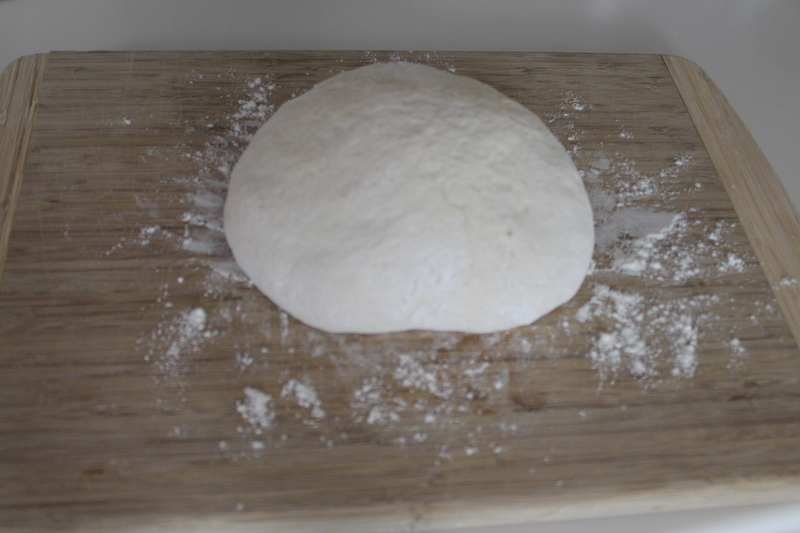 When ready, roll out the dough balls one at a time to about 10″x15″. 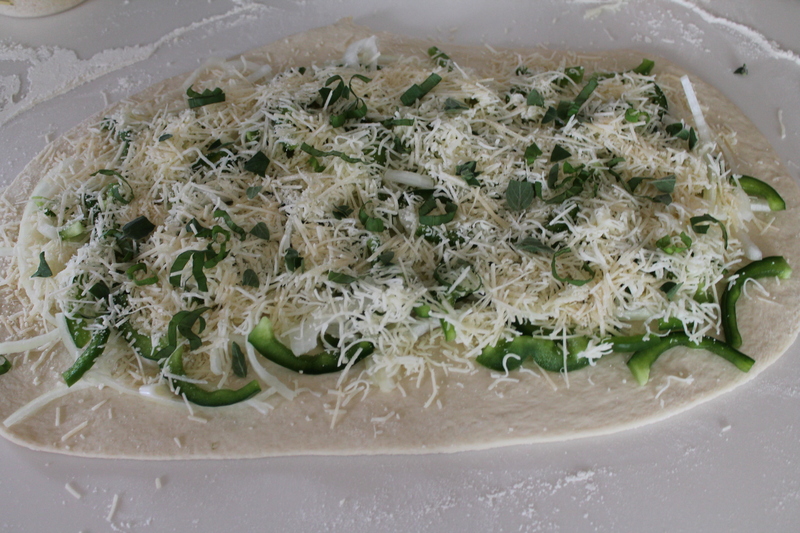 Layer with half the cheese, vegetables, and oregano, leaving a 1″ edge. 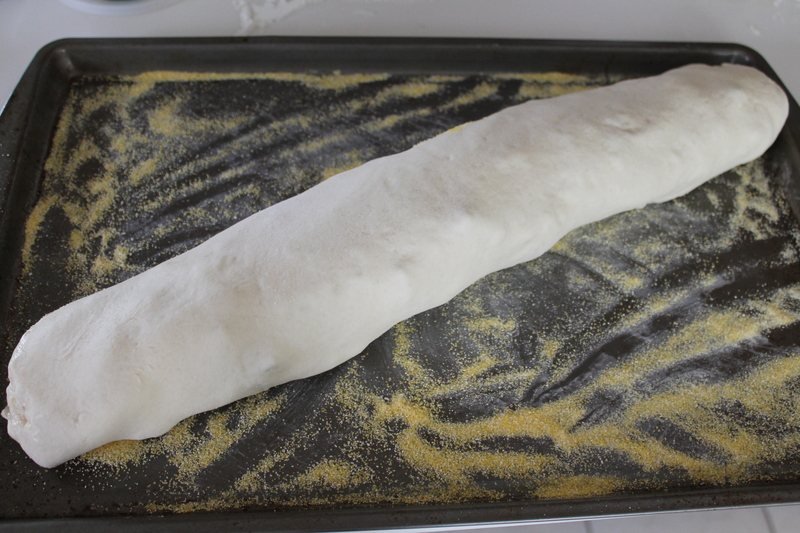 Roll the dough up into a log, trying not to disturb the fillings. Brush one edge lightly with the egg wash. Press the edges together to seal. Repeat with the second ball of dough and remaining fillings. Turn the seam side down and set the log onto a cornmeal-covered cookie sheet. Let rise another 30 minutes. When ready to bake, heat the oven to 375°. Brush the strombolis with the egg wash.
Bake the strombolis for 20–25 minutes, until puffed and lightly browned. Remove from the oven and top each with 2 tbsp. parmesan. Bake another 5 minutes, until the cheese is crusty and golden. Serve with spicy marinara for dipping. I have made pizza and calzones. I have eaten stromboli but not sure why I never made it. Thanks to you, this is now on my list to make. Oh, yum – that looks great! I am not a fan of pepperoni either, your filling sounds much better!